The City of Pella would like to encourage residents and businesses owners alike to help increase the tree canopy in our City. Over the years age, disease and insects have taken its toll on our urban forest. Its time now to think about the future of trees in our neighborhoods for the next generation. This program was introduced in Spring 2018 as part of Council's effort to encourage planting trees on property within corporate limits of the City of Pella. Please review the Tree Rebate Program form for additional information on the program. • Function of the tree: Trees can serve many different purposes. They can be used to help shade buildings, as a windbreak or screening, home for birds/wildlife, as a food source, or they can be purely ornamental. • Use of the area: Before a tree is planted the main use of the area should be considered. Is a large open/green space needed for family activities, is the primary use walking/sitting enjoyment, are there other plantings to consider such as annual flower beds, perennial plants or a garden? • Existing tree spacing: Consider the existing tree canopy. Do you want to be able to still maintain healthy grass and other plantings? Some areas may benefit from additional plantings while other areas may need less. • Environmental Factors: Some trees are more hardy than others. Before planting consider: wind (direction and intensity), sun/shade, if there is adequate soil volume to sustain tree, soil pH, compaction and drainage. De-icing materials (salt) should also be considered as this places significant stress on trees. • Existing tree species: In order to maintain a healthy community forest a variety of tree species must be used to avoid catastrophic losses should disease or insects affect a certain variety (Emerald Ash Borer, Dutch Elm disease). To maintain diversity in our tree population in any given area it is suggested to plant no more than 10% of any species, no more than 20 % of any genus, and no more than 30 % of any family. • Minimum Distances to be maintained when planting: Trees grow! Consider the mature height and spread of a tree when choosing a location for a tree near buildings, property lines, streets, sidewalks or utilities. Utilities: Refer to Chapter 150 of City Code. The links below provide general information on some of the main topics. 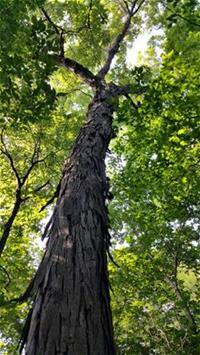 Visit the Iowa Department of Natural Resource’s Forest site for more detailed information on these and other topics.